Convenient to The U.S., Canada and much of Europe, the Dominican Republic resides at the northern edge of the Caribbean Sea on the lush, tropical island known since Columbus’ days as Hispaniola. Mountainous and verdant, the Dominican Republic has in recent years become a leading destination for tourists from many countries, and increasingly, one of its primary attractions is golf. There are dozens of challenging golf courses in the Dominican Republic, concentrated primarily in the south and east of the country, though a couple of gems are to be found along the north coast as well. Picking the five of the best golf courses is a difficult task, for at least a dozen tracks may be considered “world-class” while many others are just a few years away from that designation. One must begin one’s search in the south at the Casa de Campo resort less than an hour east of Santo Domingo’s Las Americas International Airport. This sprawling, luxurious resort complex includes several courses, each beautifully maintained and each subtly different. In addition, several nearby courses offer the visitor a truly wide range of choices. Within the Casa de Campo resort, we find what is certainly the best-known golf course in the Dominican Republic if not in the entire Caribbean region. Teeth of the Dog, (Dientes del Perro), a Pete Dye classic, got its name because of the jagged ocean-front coral formations along which it was built. The course has been described as “labyrinthine”, a reference to its twisting, up-and-down nature. A challenge to all levels of golfers, Teeth of the Dog consistently ranks in the top half of Golf Magazine’s “Top 100” golf courses of the world. Moving east from Casa de Campo, the traveler will discover the Cap Cana/Punta Cana area which sprawls along 50 miles of sugar-white sand beaches. Here, concentrated amongst the dozens of resort hotels, are some of the most beautiful golf courses in the world. 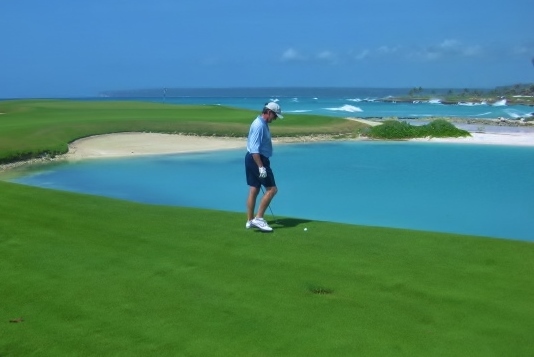 Punta Espada, a jewel of a Jack Nicklaus-designed championship course, is the first of three courses planned in the new Cap Cana resort. Perfectly manicured, Punta Espada has 15 of its 18 holes overlooking the Caribbean Sea. Challenging and serene, this track leads the golfer through a jungle, and along beaches and coralline cliffs. Not far away, the Pete Dye-designed La Cana course winds through the hilly coastal lands within the Punta Cana Resort and Club. Having four holes along the Caribbean Sea, this 7152-yard championship course features dozens of the signature Pete Dye pot bunkers, including more than 20 of them on the 7th hole alone! The golfer will find himself challenged here, though the breathtaking beauty of the area will stay in his mind long after memories of those diabolical sand traps has faded. The Hard Rock Golf Club at Cana Bay, located in the Hard Rock Resort in Punta Cana, is a fabulous Jack Nicklaus-designed championship course which has been the site of past DR Open championships. This is a very challenging, beautifully manicured track that will demand everything from golfers of all levels. The level of service here is exceptional from the lovely clubhouse and terrace restaurant to the ice-cold towel presented at the end of your round. Last in our group of top five courses in the Dominican Republic, (though by no means least) is the breath-taking Playa Grande course between Rio San Juan and Cabrera on the Dominican Republic’s north shore. This was the last course designed by legendary golf course architect Robert Trent Jones, Sr. A masterpiece by any measure, the course winds along high cliffs with views to rival any in the golfing world. Currently, under renovation, this championship-level course will soon re-open and will take its place among the world’s most beautiful. Many more lovely golf courses dot the Dominican Republic, and quite a few should arguably have made this list. The writer is a 20-year resident of the country and these are my favorites, however, many will happily disagree. Such is the variety and quality to be found here in the beautiful Dominican Republic. So now you have an idea of the golf treasures to be found in the Dominican Republic, a jewel of the Caribbean. Whether you choose to rent, rent-to-own or purchase outright, Select Caribbean Properties will happily provide you with excellent choices in condominiums, villas or large tracts of farmland ideal for those desiring countries living. Select Caribbean Properties has representatives throughout the Dominican Republic, all multi-lingual and well-versed in the process of purchase here. Contact Sabine Mertes at 809-885-2260 or check out her website www.selectcaribbean.com and she will help you find “the dream”.